Whenever I feel like my wine selection has gone off the map I go back to a Côtes du Rhône. Really any CDR will do. 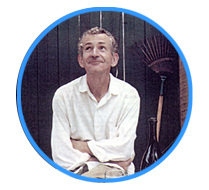 Whenever I feel like my perspective on wine has gone astray and I start using flowery descriptive words I go back to Billy Munnelly – my wine guru / sansei / Yoda. 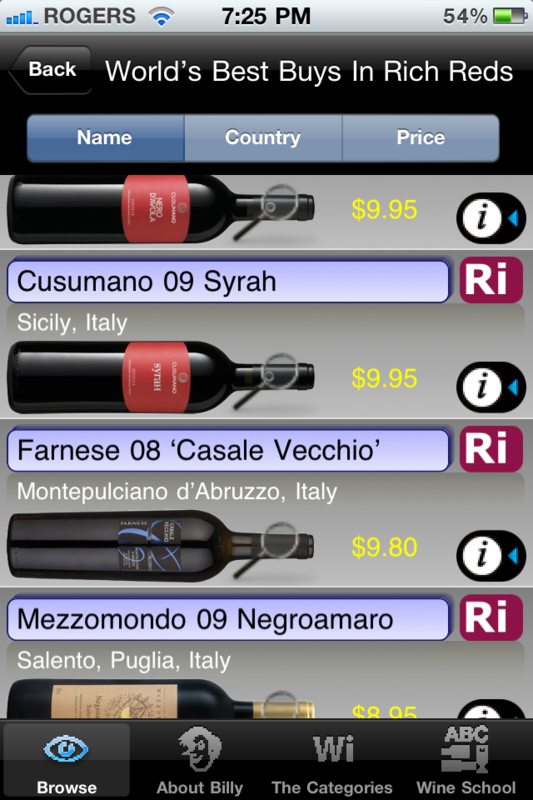 Billy’s back with a fresh new web site and a great Facebook feed of wine recommendations and descriptions. 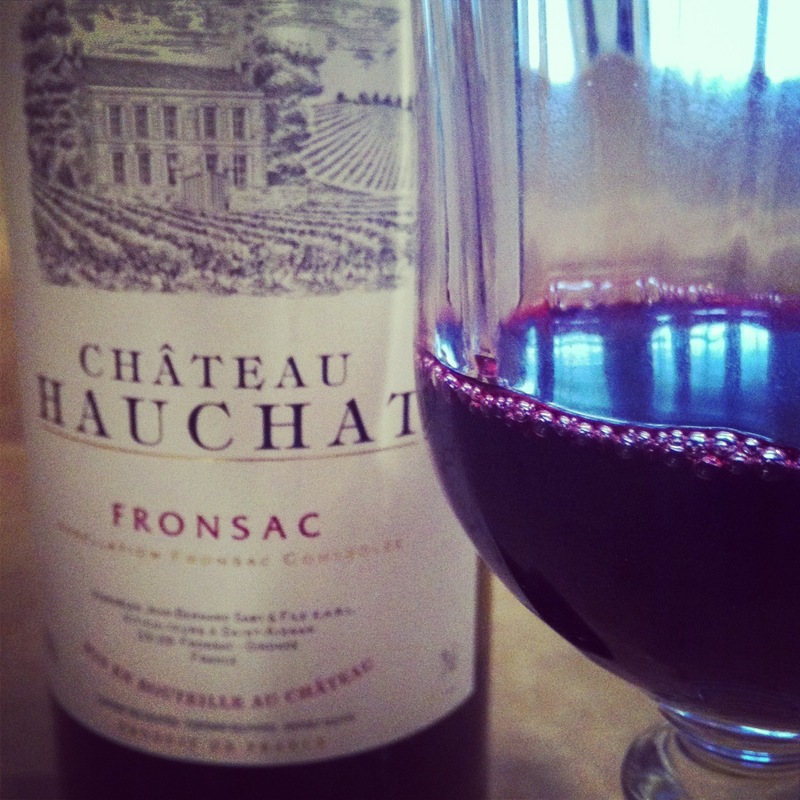 His last recommendation that I acted on was the Chateau Hauchat Fronsac – a Bordeaux for under $15. I bought 6! 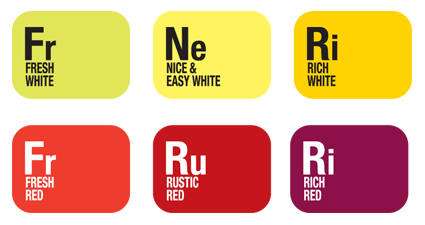 Check out Billy’s “Wine by Mood” – the cleverest thing ever written about wine. Who is Billy? Billy is my favourite wine writer – funny, irreverent, slightly silly, and a man who appreciates a good glass of wine (although I suspect that it seldom stops at one glass). What’s not to like about this man? 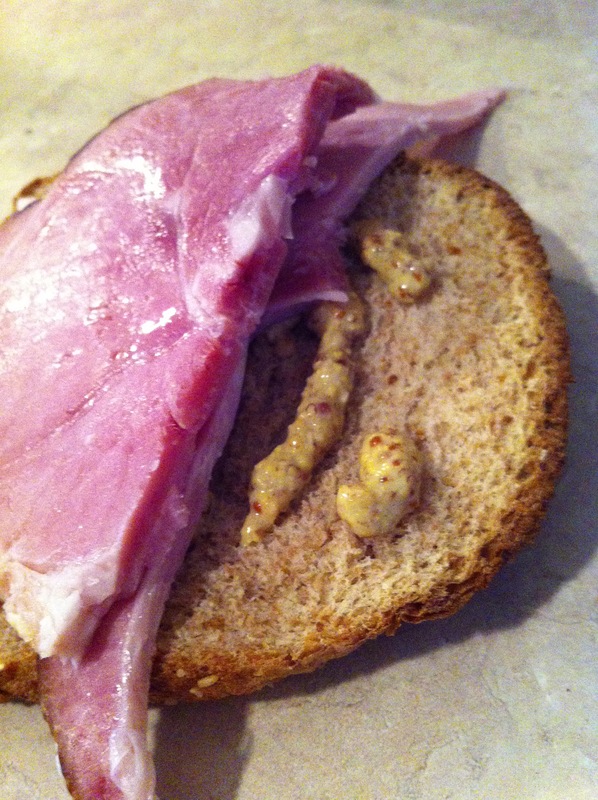 The cleverest thing I’ve done in the last week was buy a spiral ham at Zehrs and bring it out of each night to snack on. Add a little grainy mustard and some grainy bread and it’s the definitive Easter snack. Also, I opened a bottle of Chateau fancy-pants Bordeaux from the region of Fronsac – ’cause it’s delicious and cost only $14. Special shout out to Billy of BillysBestBottles for the wine recommendation. Keep them coming my friend. I have just realized that I love Barbera wines. Barbera d’Anything is good. 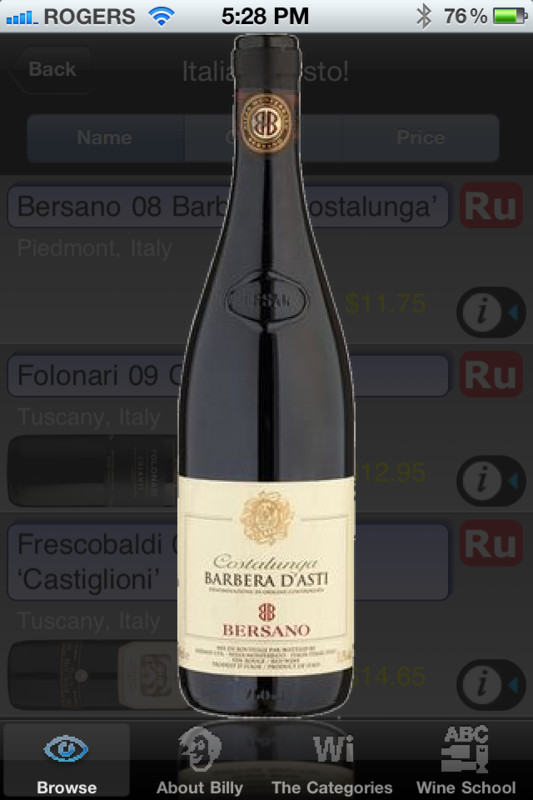 Barbera d’Asti, Barbera d’Alba, or Barbera d’Ann (“that’s ridiculous – that’s not even a wine – it’s a song by the Beach Boys – he’s making a Beach Boys joke”). I think I even like Barbra Striesand. 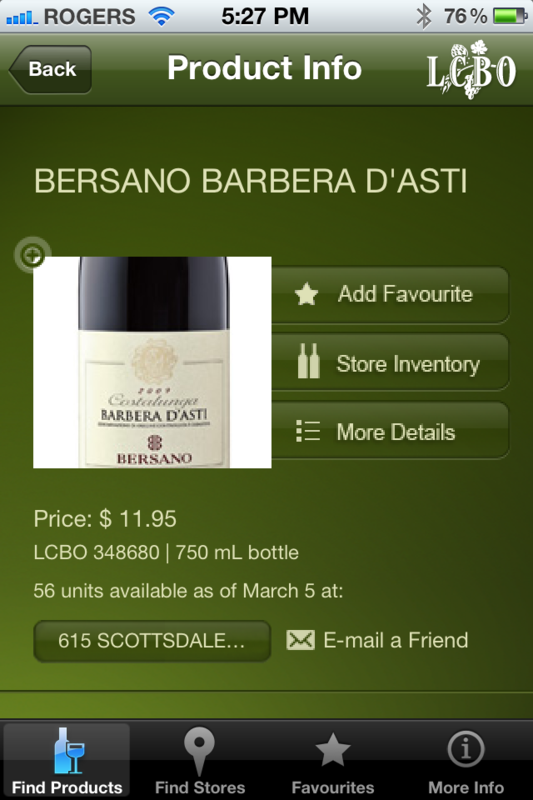 I found this Barbera d’Asti using my BillysBestBottles app (in the category of Rustic Reds)- then verified that it was available in my closest store using the LCBO app – all this while standing right in front of the wine I was looking for while having a conversation with the manager of my local LCBO. No kidding. I could have just asked him for a recommendation but its more fun to justify my iPhone again this month. Barbera is the grape used in Piedmont Italy to make fantastic wines – berries, cherries, and low tannins – who wouldn’t like that for a simple, delicious wine. This one is inexpensive and tasty. I am a big fan of Billy’s Best Bottles and the genius behind the brand – Billy Munnelly. I first became a fan of Billy while reading about a wine tasting in the Toronto Star. The author of the article was listing the people at the tasting and remarked that while the “experts” were waiting for the wine to be poured Billy Munnelly was in the corner trying to figure out how to get the hotel’s espresso machine started. I felt an instant connection with that man in the corner. Now Billy, and his partner Kato, have come up with a BRILLIANT (yes, I meant to yell that) app for the iPhone – and happily, I own an iPhone (thank you Steve Jobs). I could play with this app all day. 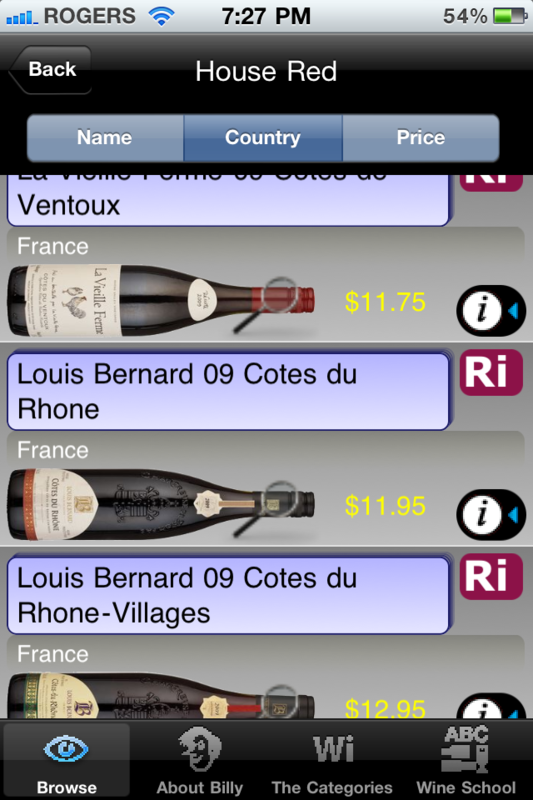 I let my wife open the app to look at – she was won over instantly by the cork that spins when the app opens. She’s easily amused by things like that. So am I. 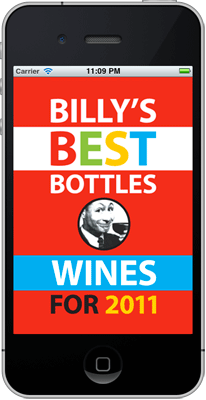 The App is as easy to use as the Billy’s Best Bottles book and more convenient because it’s also on my telephone. Albert Einstein, you would have been so happy to live in these crazy times. Recently I guest blogged at Linktrap.com and praised Billy’s web site as one of my places of inspiration on the internet. Now it’s on my phone. Admittedly I have only been blogging for 5 weeks so it’s a little misleading to have a “Best Of” posting. However, as anyone who knows me will attest to I have talked about my blog so much that it seems that I must have been blogging all year. I have learned much during the past 5 weeks. I have learned that I can become obsessed with my own writing – as a PE teacher I love it when people in my English department give my writing a passing grade and I stay awake most of the night if they give me anything higher than that (Billy Munnelly and Natalie MacLean’s online comments kept me awake for a week). Also, I don’t care if my editor Andrew Douglas has hit my blog site for half of the 600 hits that I’ve received, his good opinion is worth it even if he is stalking me. I read the other day that top 5 lists are all the rage, replacing the top 1o list – that says something about our attention span and busy lives doesn’t it? If you do make New Year’s resolutions then make one to slow down and enjoy your glass of wine while doing nothing else. Don’t computer surf, watch TV, or read a magazine – allow yourself only the distraction of another person’s company. I have listed my top 5 postings for 2009. Click on the title if you want to go back and read some of my favorite earlier posts. 3. A Case of Champagne please – my favorite wine writer Billy Munnelly wrote me after this one and called it BRILLIANT , the most encouraging email I’ve ever received that wasn’t from my mother. My favorite line – “that’s a level of snobbery that I am interested in”. 4. A wine cellar this Christmas – “keep something French and white in your cellar and I don’t mean a mime” – Andrew, Anne, and Doreen all wrote me within 10 minutes of this posting telling me they loved the mime reference. Thanks to my school’s Co-op department for listening to me talk about my blog everyday, to Andrew for hooking me up with wordpress, to my brother in Spain and Rob & Carolyn for inspiring me, to Shelley for letting me write and pick wines for the Red Brick Cafe (the finest cafe in Guelph), and to Danielle whose company is my only distraction when enjoying a glass of wine.